The unhappy inhabitants of planet Krikkit are sick of looking at the night sky above their heads–so they plan to destroy it. The universe, that is. Now only five individuals stand between the killer robots of Krikkit and their goal of total annihilation. How will it all end? Will it end? Only this stalwart crew knows as they try to avert “universal” Armageddon and save life as we know it–and don’t know it! 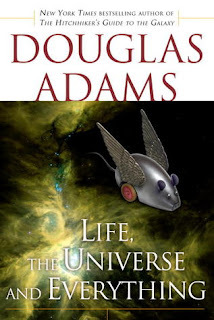 After a prolonged reading slump, I finally got back into the groove with the next instalment in the Hitchhiker's Guide to the Galaxy Series - Life, the Universe and Everything - which is a bit surprising since I'd found the second book lackluster compared to the first one which was so.much.fun. I don't know, I think this was exactly the type of book I needed to get over my slump. They're all quick reads, or listens since I'm doing these on audio, and the general silly tone of them all makes it easy to fall back into. You don't need a ton of concentration either because they're really all just good fun and with my beloved Martin Freeman narrating once again (especially after the finale of Sherlock) it felt like coming home again...if home happens to be anywhere in time and space. Anyway, as I was saying the plot shifted straight away in Life, the Universe and Everything and saw our heroes set off on a whole new adventure. Yes it was random, silly and less plot-focussed than I think most of us are used to but it was still good fun. There was a bit of a mystery this time around too and a concrete quest but being an avid quest-reading, I just gobbled this instalment up even more! All of the stories in this series have made me laugh out loud multiple times throughout which makes it easier to forgive convenient plot-devices and nonsensical aspects. These books are clearly meant to be fun and imaginative, a feat which they accomplish time and time again - and this instalment is no exception. Fans of space adventures, humor and people like me, bent on brushing up on their classic sci-fi really should check out The Hitchhiker's Guide to the Galaxy! They're quick reads that are sure to make an impression. I definitely recommend the audiobook version too: Martin Freeman is brilliant! I should really give this series another try. I only read part of book one (I know!) and it's long overdue for me to come back. I normally love humor with SF so I'm not sure what my problem was the first time around. Anyway great review and this one sounds fun! I do love how imaginative they seem. Oh, I need to read these books! I love a good fun read (or listen). You've convinced me. I'm glad you continue to enjoy this series. Yeah, there are a lot of great, fun characters in these books, but to me Arthur Dent is the best protagonist for the series so it's a shame that he is not always the focus. And I second all you say about Martin Freeman as narrator here - brilliant move bringing him on! It has been so long since I read these but I remember them being a ton of fun. Glad you are enjoying them!